Exclusive new liquid-filled bandages minimize friction and shear to prevent blisters, corns and calluses or protect them after they’ve formed. Ultra-thin so they fit in any shoes. Clear and nearly invisible. Flexible and conforming to foot contours. Self-adhesive so they stay in place. Also effective for diabetic skin-care and other friction-reduction applications. Small Bandages fit toes. Large Bandages fit bunions, heels, ball-of-foot. 4 per pack. Non-sterile. If you have diabetes, poor circulation, or fragile skin, consult your doctor before use. 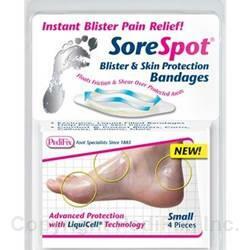 Do not use on blisters caused from burns, or on any infected area. If new or increased irritation occurs, discontinue use and consult your physician.